If you are up for an exhilarating travel experience, Greece surely tops all travel bucket lists! Be it the blue skies or exciting voyages in search of treasured islands across the Aegean seas- Greece has seduced travellers from time immemorial! But I hope to make a case for Athens today! With much celebrated history, abundant museums stocked up on art and relics-Athens will surely top your wildest expectation – I tell you.The buzzing crowds, splendid sunsets, the vibrant markets with haggling tourists and the ever-so-divinely scrumptious –no –faff cuisine, there is just so much to see and experience - A trip to Athens will surely be a one that will be remembered! Like any grand pilgrimage, it has to start at the Acropolis, and an early start at it, I recommend,to dodge the long queuing! 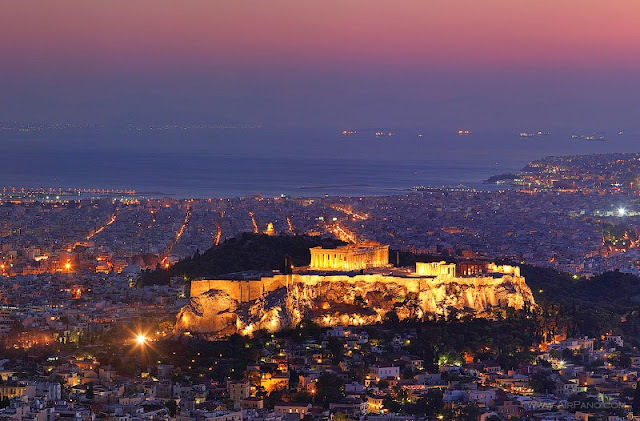 The mighty citadel Stands ever so tall, towering over the city.Acropolis is a total win-win not only does it house some of the oldest monuments in the world but with spectacular one-of a kind –aerial(ish) views of the sprawling city – it will win you over in no time! 2.THE ONE AND ONLY PARTHENON! The heart and soul of Acropolis has to be the Parthenon, the ‘perpetual’ temple has lived through countless wars and outlived time itself! Grab hold of a local guide to experience finest patriotic lesson in ancient greek history and it’s much delightful to witness the pentalic marble metamorphosize into a magical golden hue with the setting sun. Once you’ve soaked up all the history, set forth and hit the streets of Plaka! With trattoria’s galore and plentiful shopping options, there is much to be explored and much wandering involved and it truly gives you an opportunity to get intimate with the city! From dainty jewellery to gladiator armoury,the flea market in Monstriaki is quirky and oozes eclectic charm,there will be much fun and the Roman Agora is just around the corner! Hidden in the inner streets of plaka is some of the finest art stores, you might be even lucky to pick up beautiful Aegean landscape portrait at a nifty deal to adorn the wall back home! Athens is proper Mecca for Museum-enthusiasts! From world-renowned to best in the world , Athens truly is museum aristocracy! With over 5 museums to pick from,a museum visit is almost dutiful! The Acropolis Museum seated at neighbouring distance from the grounds of Acropolis,houses all the excavated artefacts from the temple of Parthenon and truly takes you back in time! With glass floors and spectacular ceilings, the museum makes a magnificient- contemporary, abode for all the relics. The Temple of Zeus is pretty hard to miss, situated about 700m from Synatagma, the remains of 104 columns is certainly worth a visit!It took several leaders and empires to get the temple to completion and it was under Hadrian Empire in the 2nd century AD the temple was said to have fully finished. Despite being a victim of many barbaric invasions a substantial part of the temple still remains. The Panathenaic Stadium is a top tourist attraction! Built in 4th century BC initially to host Panathenaic athletic games and later a marble revamp was provided under the leadership of Herodes Atticus it’s said to have hosted the first modern Olympics in the year 1896. A sprint on the running track is legacy of one of its kind!